Locally Groan: Can Inexperienced NBA Prospects Win A Title? Can Inexperienced NBA Prospects Win A Title? The 2009-10 Kentucky Wildcats, among the youngest basketball teams in Division I, “only” made it as far as the Elite 8 in this year’s NCAA Tournament. With five players apparently headed for the NBA and four of them freshmen, the team generated a lot of speculation about whether an inexperienced team, even one loaded with NBA talent, can win the championship. Kentucky was, to say the least, young and inexperienced. Ken Pomeroy calculated an experience factor for all 347 Division I teams and posted them on his website, kenpom.com. He weights the player’s class in school by the number of minutes actually played to obtain not just an indication of how many upperclassmen are on the team, but which one’s actually played. UK ranked 341st, with just six teams in all of Division I having less experience playing in the NCAA. Referring to UK’s loss to West Virginia, one of the more uninformed posts I’ve read said, “UK lost the first time they had to play an experienced team.” Since UK didn’t play any of the six teams ranked less experienced than themselves, every single game they played in the 2009-10 season was against a more experienced opponent, yet they ended the season with a record of 35-3. UK beat UCONN, Auburn, Mississippi State, Alabama and Tennessee during the regular season and all of those teams were more experienced than the Mountaineers. UK also soundly defeated Cornell in the third round of the NCAA tournament, a quality team with a Pomeroy experience ranking of 8— about the same distance from the top of the experience ranking as UK was from the bottom. In this year’s tournament, only Arkansas-Pine Bluff (6) and Notre Dame (3) were more experienced than Cornell (8). Ironically, A-PB and ND, the most experienced teams in the field, both lost in the first round. The argument that UK was too inexperienced to win the tournament is also weakened by the fact that only four of the tournament’s 64 entrants made it farther in the tourney than did the Wildcats. So, while many argue that UK didn’t win the championship despite all that talent because they lacked experience, one might also argue that 62 other teams didn’t win the tournament, either, and UK came as close or closer than 97% of them. A single tournament doesn’t provide a significant statistical sample, but it can provide some interesting observations. I divided the 347 teams with experience ranked by Pomeroy into quartiles. Since “quartile” is one of those words that numbs the mind, let’s refer to the most experienced teams, those ranked 1 through 87, as seniors, and the remaining three groups as juniors, sophomores and freshmen. Kentucky (341) and Kansas (264) would then be referred to as freshmen, since their weighted class rank falls into the bottom one-fourth of experience of all 2009-10 NCAA Division I teams. Duke (70) was a senior, Syracuse (181) and Butler (177) juniors, for example. To win the NCAA tournament, a team first has to make the field. Two-thirds of the 64 teams invited to the big dance were from the middle of Division I in terms of experience. Surprisingly, more teams made the tournament from the junior and sophomore classes than from the senior class. This distribution would seem to imply that having some experience is important, but having lots of experience isn’t an additional advantage in reaching the tournament field. How did inexperienced teams fare in the 2010 tournament? Perhaps surprisingly, less experienced teams won more than half of the games played in this year’s tournament— 32 of the 63 games, or 51%. Teams highlighted in yellow in the bracket diagram below won games against more experienced teams. Considering the entire tournament from round one through the championship game, experience doesn’t seem to have been a huge factor. The less experienced team actually won 20 of the 32 first-round games (63%). The first round, however, hosts the greatest discrepancy in seeding (1-seeds play 16-seeds, for example), so a good but inexperienced team like Syracuse defeats a more experienced but weaker Vermont team. Not that surprising. Still, five teams with less experience and a worse seed won their first-round games. The later rounds are more interesting. As the tournament progresses, the seeding advantage decreases and we end up with 1- through 5-seeds, in other words, teams with better-matched talent. 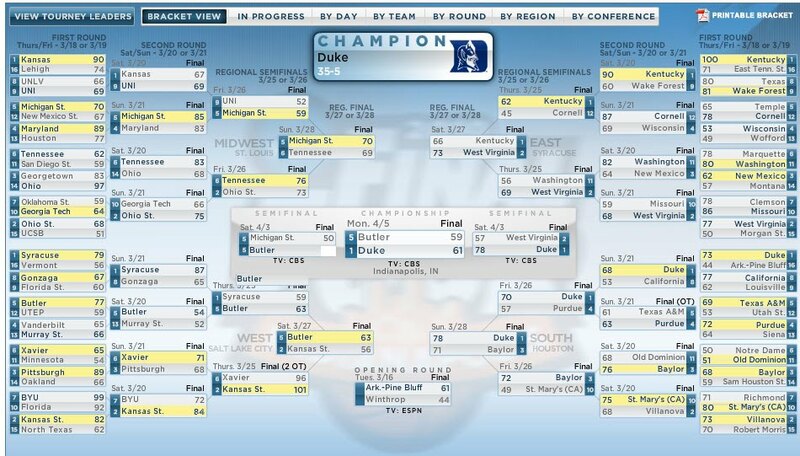 Less experienced Michigan State (205) beat Tennessee (98) in the Midwest Region. With comparable seeding, the less experienced team won. Similar results came from the West, where junior team Kansas State (159) was more experienced than sophomore team Butler (177), and was seeded quite a bit stronger at 2 than was Butler at 5. The less experienced, higher-seeded team won. In the East Region, UK and West Virginia were seeded 1 and 2 respectively, but the Mountaineers (147) were a junior class to UK’s (341) freshmen. In the South Region, Duke (70) beat a significantly less experienced team in Baylor (170). They were seeded 1 and 3 respectively in that region. The two more experienced teams won. Interestingly, half of the Final Four teams beat a more experienced team in the regional finals to move on to Indianapolis. In the championship game, senior Duke beat sophomore Butler, but in a game that went right down to the wire. Top-seeded Duke beat a significantly less experienced team in Butler, but only by a basket. So far, from this limited data sample of one tournament, we might deduce that some experience increases a team’s chances of making the tournament field, but additional experience doesn’t seem to add a lot. Less experienced teams win more often than not in the early rounds, but that is also a time when more experienced teams may simply be over-matched in talent. Less experienced teams win the regional finals as often as more experienced teams. In the Final Four, however, the more experienced team won every game. Does this suggest that experience is more important in the Final Four than in earlier rounds? 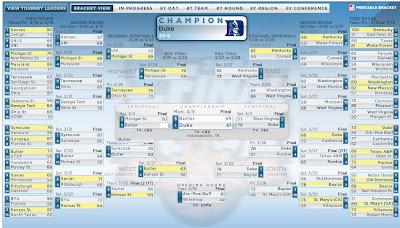 Just for grins, I decided to look back at the last five Final Fours. The Final Four team with the most experience, Duke, won the 2010 tournament. In 2009, North Carolina (60) won over marginally more experienced Gonzaga (52). In 2008, Kansas won the title, also with the most experience. Florida won with the most experience among the four finalists in 2007, but while they were the most experienced among that small group, they were only juniors among the full set of Division I teams. The entire 2007 Final Four wasn’t especially experienced. While experience may not be the critical factor to get a team into the tournament, the most experienced of the Final Four teams does seem to have the edge at winning the championship for the past few years. But does this argue, as many suggest, that a highly talented but inexperienced team like UK fielded this year will never win the title? In 2006, Florida won the NCAA tournament with four sophomores and a junior. Pomeroy doesn’t have experience statistics for that season, but one can be calculated from the team’s individual data. For the 2005-06 season, the Gators had an experience factor of just 1.26 years. That would have ranked them around 290th in this year’s Division I and would have positioned them in the least-experienced quartile of any recent season— in fact, in the bottom 15% for 2010. So, it’s already been done. At least once. And recently. I Don't Know. Third Base!